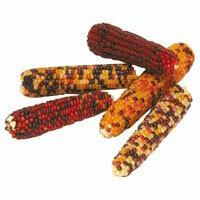 Ornamental corn is a flint type corn that was grown for food by the Indians of both North and South America. Today it is grown for ornamental purposes. Ornamental corn will grow in any sunny, well-drained, fertilized soil that will grow field or sweet corn. Adequate moisture, especially after the ears form, is necessary. Isolation is suggested. Bird damage can be a concern. Use fertilizer recommendations for sweet corn.